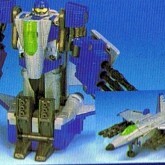 Autojetter's job is to guard Galvatron when he flies in Dragon mode; he stays close by to keep their command of the air. He has a disturbing nature of considering the war as his own entertainment. 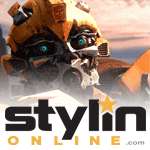 He has once crashed while in Jet mode because of a dragonfly flying into his intakes, and has detested insects since then. The triple rockets on his arms are very effective both on land and water. 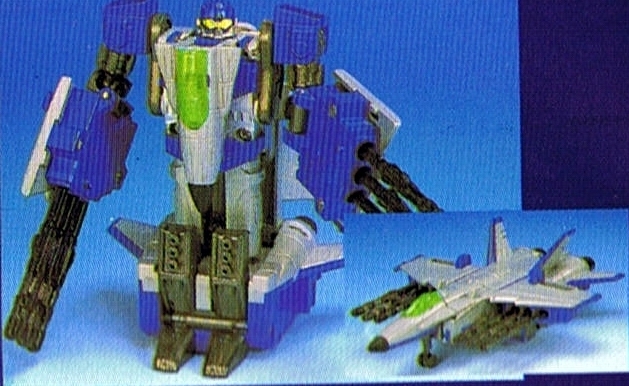 Autojetter is a recoloured version of a cancelled G2 figure. In earlier BWII catalogue, a picture of the prototype of this unreleased figure was used instead of an image of the actual product. Autojetter was also available in a VS set with Tonbot (The Showdown in the Stratosphere/VS-19).